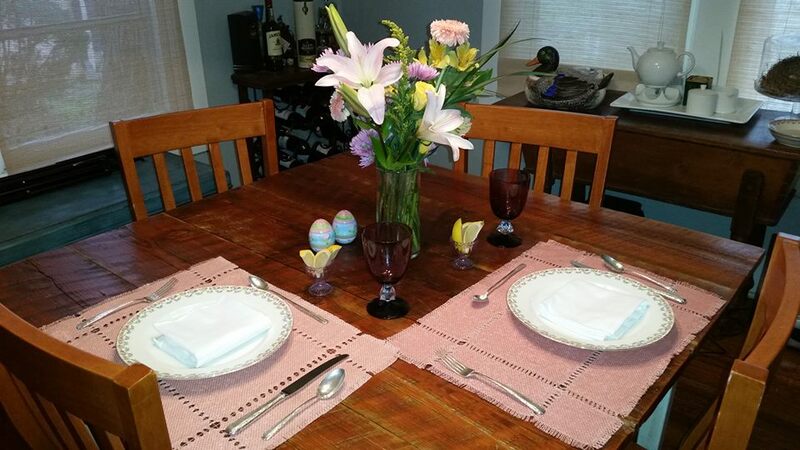 I decided yesterday, sort of spur of the moment to invite a friend to come have dinner with us on Easter. His parents are a long drive away, as is my mom, so - why not? Anyway - a small flurry of cleaning this morning, then I needed to make a quick run to Walmart and Publix. I was picking up a gallon of tea at the latter when I heard someone behind me say, "Well if it isn't one of my favorite people!" Now, I was in Franklin, and it's not my normal store, and so I assumed that this woman was talking to someone else. But I turned, and it was my friend Suzy. I met her at a gathering one of my old bosses held for his birthday. I liked her right away, and wouldn't you know, we kept seeing each other at parties with this group. She's just bubbly, and warm and lovely in every sense of the word. She is a good wife and mother of three great kids, but she's also her own person, and she also dresses really cute. She smokes and drinks at parties, and she plays tennis and loves Las Vegas. She has a yorkie named Elvis. Last year, she invited me to a party at her house. She and her husband have a terrific, beautiful home in Franklin - it was a deck/pool party and the place was mobbed. I met a bunch of interesting folks and even got to meet her Dad, who I told how much I liked his daughter. She's just the real deal. So, obviously, I'm a fan. But for her to call me one of her favorite people... well, that made me feel ten feet tall. Suzy was obviously one of the popular girls in school, and it's just nice to be liked by one of the cool kids. But the thing I have learned in my 42 years on this planet is that even cool kids live in the real world with the occasional pothole in the highway. She lost her a sister some years back. Her oldest has Down Syndrome. She is an advocate for him, and for programs dedicated to kids who need a little more assistance. But it's a part of her life. Fully integrated with a lot of other parts of her life. You get the idea. I like Suzy, and it's super cool that Suzy likes me. I managed to get the things today that I absolutely couldn't put off til tomorrow - namely, alcohol and some decorative elements. The menu for tomorrow is still in flux. It kind of depends on the meat situation tomorrow morning. If I can find my first choice, fabulous. If not... well, onward and upward. We'll figure it out. It's nice to have a little party. Celebrate good times, come on! I'll show you my nice table tomorrow. Technically, today - only later.